WDC Investigates: Printing – What Size Printer? Finally, we come to the important job of choosing a printer. First, you should consider the maximum size of print you are likely to need to print yourself. If you are content with A4 as the limit, there is a huge choice available. 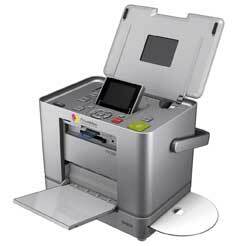 You may also want to consider an all-in-one printer, which is basically a printer with a built-in flatbed scanner. Or if you are only interested in printing 6x4ins, you can opt for a mini printer. Though these can be very convenient to use, be warned that in the long run and especially if you are printing large batches of prints, using a commercial photofinishing service in the high street or online will work out cheaper. The choice becomes a lot smaller when you go beyond A4. There are not much more than half a dozen A3 printers from Canon, Epson and HP. If you may want to print on relatively stiff card, check to see if this is supported by the printer via a straight, or nearly straight, paper path. The physical sizes of these printers varies a fair bit too. Ink type supported is also an important factor. Once you have a shortlist, try to get hold of reviews or hook up with other users of the printers you are interested in, maybe via the web, and hopefully the best printer for you will reveal itself!